A tough, fast growing tree with upright arching branches. 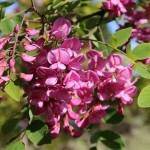 The late spring, pea-like flowers are purple, wisteria-like, and held in pendulous racemes. Bees are attracted to the flowers. The leaves emerge bronze-red and turn to green as they mature. The fall color is yellow. 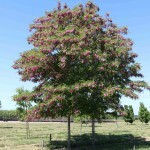 It grows well in hot dry climates; adapts well to urban conditions and poor soils. Also called 'Casque Rouge'. Patented in 1964.